Initial (ideas around) proposal for a research project. The 2 images above outline the sorts of things I have been doing and thinking about for my major project and the related artists and ideas I have been exploring for the contextual studies element. Although this statement has been made with the major project in mind I think it conveys some of the issues I am interested in. Goldsworthy’s words ‘Learning and understanding through touch and making is a simple but deeply important reason for doing my work’, have a resonance for me. Willow has become my vehicle through which I can try to explore my world. A piece of willow is a line and its natural inclination is to make a circle. These are elements I can see in my work. Along with the physical nature of working with the willow, it is has a repetitive nature with a sense of rhythm, it is intuitive and very much led by the material itself and the outcome is always uncertain. I have very much tried to focus on the doing, responding intuitively and spontaneously to my creative activity. I have worked with willow, both living and basket makers willow, I have made studies and drawings of various aspects /details of the willow work, I have also used photography to record the willow, but have also photographed drawings that I have then manipulated using photoshop. These observations could be viewed as a way of trying to understanding the process, but possibly also to transform them into something different. The living willow sculptures add a different perspective to consider. In contrast to the observation of nature, it requires a negotiation with nature- the form I can achieve has its limitations that are wholly led by how the willow grows. A way of working in collaboration with nature that requires an element of nurturing and the out come will be reflective of how well that is done, which in turn requires an understanding of its needs. The nature of these works is also slow. Dependant on the turn around of the seasons, when in the winter months the new growth can be woven back in. In a wider context I can relate my work to concerns around the natural world and the need to try and create a more sustainable future. I did look at the work of Lizzie Farey, and what interested me in particular was the link to her work in an exhibition, that in turn relates to the ‘slow movement’. In many ways this links into the natural environment and issues around a sustainable future. 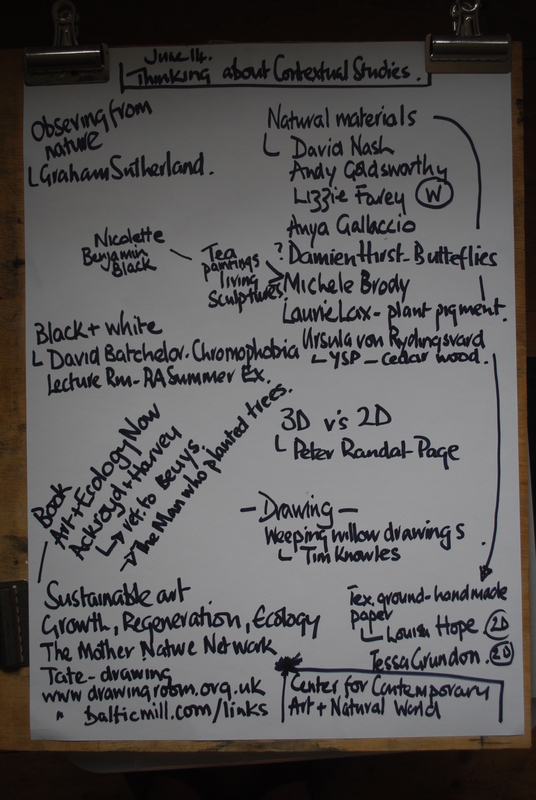 The book, ‘Art and Ecology now’ feature lots of artists who are currently making work around these issues- Ackroyd and Harvey caught my eye and their work around Oak trees that references Beuys. Lots to follow up, but I think pinning down the exact nature of my research project at the moment would be a bit challenging. 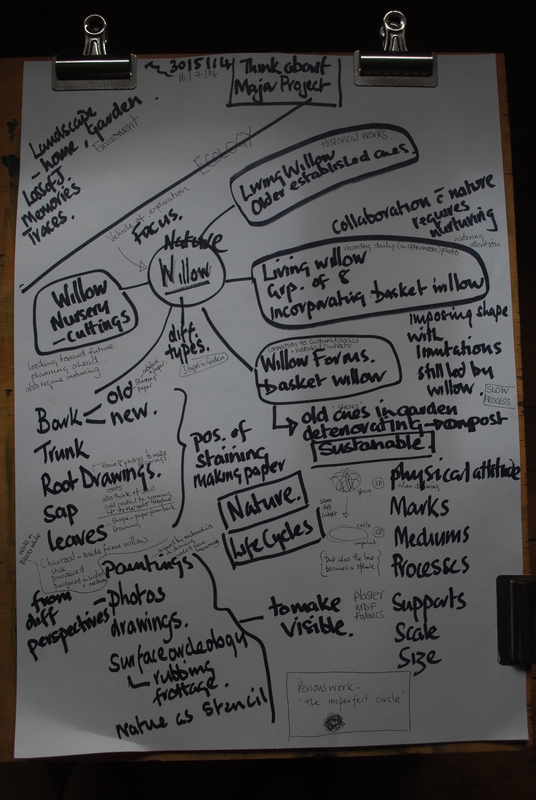 I have been looking at the website of The Centre for Contemporary Art and the Natural World and they have some interested information relating to their aims as a group and the relevance of that connection between the arts and nature- that might be an angle to follow up. I was also interested to see that there are already connections between them and Hauser&Wirth, Somerset that has only just opened. I visited on its opening day and at that time was interested to see them include ‘gardening and ecology’ in their areas of interest. Perhaps an emerging area of interest? Other areas of interest have been around the relationship between 2D and 3D work and how they inform one another, which is what inspire my Randal-Page piece. I have noticed there is an artist, Ursula von Rydingsvard, currently at the Yorkshire Sculpture Park, also exhibiting a combination of drawing and sculpture. What interested me about her is that one tree lies at the heart of her practice, the cedar. My interest in the ‘black and white’ angle come s from much of my work being monochromatic at the moment. I don’t feel drawn to be using lots of colour and this is perhaps reflective of my time. But it does interest me too that there is maybe an increase on monochromatic work generally, certainly ‘drawing’ seems to be having a revival and was in evidence at the RA show. Is this perhaps reflective of our times more widely? So I shall continue to explore these ideas in order to come up with a more concrete proposal. Contemporary Artist- Peter Randal-Page, Sculptor. Exhibition Review- BLACK AND WHITE- Summer Exhibition at The Royal Academy, London. Self –assessment- checking work against criteria. Demonstration of subject- based knowledge and understanding- I have certainly been looking at a broad cross section of works and considering a number of ideas relating to my current practice. Demonstration of research skills- Both of my written pieces, an exhibition review and a piece about a contemporary artist, were supported by both primary and secondary research. Much of the secondary research was made using the internet. Demonstration of critical and evaluation skills- I think what I have written does evidence an engagement with concepts, values and current debates, and show a level of thought around the various issues. Communication- I think I have been able to communicate my ideas and knowledge through the written word, and potentially communicated more widely through adding to my blog. I have tried to communicate clearly the sources of my research through adding links on my blog.